Table 1 shows the fuel tank capacities of the Altair in U.S. gallons (U.S.G.) and Imperial gallons (I.G.) This information was derived from various sources as listed below. The table also shows the weight of fuel for each individual tank in pounds (LBS) . Table 2 is based on the following drawing which appeared in "The Courier-Mail", published in Brisbane on 26th October 1934. The caption states that the drawing is based on information supplied by Sir Charles Kingsford Smith. It will be noted that the tank capacities are very similar to those shown in Table 1. 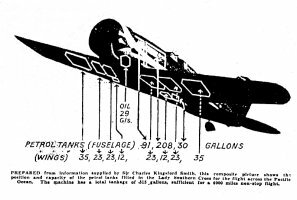 J.P. Juptner "U.S. Civil Aircraft"
Drawing of the Altair fuel tanks based on information provided by Smithy and published in "The Courier-Mail", Brisbane 26OCT34.
" IMPORTANT Your 1453/9. USB full details one additional fuel tank forty gallons capacity being installed each wing. Tanks centre line located 12 feet from centre line aircraft. These tanks mounted in metal straps and felt attached to spar webs similar to D.H. 80. Fuel leads connect with adjacent wing case. One extra tank 24 gallons being installed under front pilot seat final mounting and fuel connection not yet decided. Additional weight of tankage 62 pounds, fuel 760 pounds, this increases tare to 3737 pounds Total fuel 3817 pounds. All up load 7522 pounds." Considering that this message was sent within a day or so of a first hand observation (of 2 wing tanks), it must be given greater credence than Sir Lawrence Wackett's recollection (of 4 wing tanks) forty years after the event! However, it should be noted that there is an apparent error in DSCA's addition and he has also failed to allow for the weight of crew, equipment, radio and oil as stated on the Australian CofA. Furthermore, it will be noted that the stated capacities of the added tanks are at variance with those derived from other sources. This raises the question of whether or not Wackett and/or Smithy were forthcoming with accurate capacities or if the DSCA estimated the capacities of the three added tanks. Whilst we may never have a definitive answer, it can be seen from the following table that the maximum variance in the total capacity of the three Wackett tanks is only a mere 8 gallons. As there are several anomalies with the weight calculations in the DSCA's message, we need to examine these. As mentioned previously, in addition to an apparent arithmetical error, no provision has been made for crew, equipment, radio and oil. Again, we may never have a definitive answer, but the preceeding figures suggest that the Altair, in its Pacific flight configuration, may have been significantly heavier than estimated by the DSCA. Added information regarding removal of Wackett wing tanks.